What do you do with your old guidebooks? 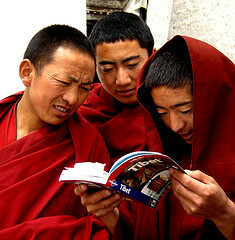 At some point in our travel planning, many of us consult a guidebook. How much we each rely on it differs, of course—from those who give a cursory glance early in the process to those who carry it around like a totem from place to place. And some have thrown over guidebooks nearly entirely for Web content. But however we consume the information inside it, what’s left when we return from our travels? Is it a trusted source or something to be recycled? I often hang onto mine for a little while—to fill in place names I may not have written down in my notebook. But ultimately, I give them away to a friend or a shop for used books. Even if it wasn’t of particular use to me, it may be to someone else. I have a friend who keeps his guidebooks like trophies. Looking at them on his bookshelf spurs memories of his travels, just like his photos or his travel diary. It’s just another medium for him. I wonder if at some point, he’ll begin to question this method because he’ll run out of storage space. But for now, he’s got plenty of room. Another friend never returns with her guidebook. She tears out the pages she needs while she’s on the road, and gives the rest away to travelers who are in need. To her, it’s served its purpose in the field. We usually stick them in the bookcase until one of our friends is going on the trip. We like to leave notes between the pages (and on them) and many of these places we’d love to return to. I hate buying guidebooks but I like to have a few facts and maps (especially in the developing world) so I usually end up with 10 year old lonely planets i get from book swaps or used book stores. I use them for basic facts and some cultural info as well as the maps. For the rest I use the web, namely wiki travel. As soon as my itinerary is fixed I rip out the pages I need and binder clip them together. This way I never have to lug around a whole book and I can quickly get to the map I need. This is going to sound more ridiculous than it is, but I pre-make my own guidebooks by noting possible places to stay/things to see/etc. in my travel journal and then fill in around it during the trip, along with notes on currency exchange/costs. Like beside a town with a famous waterfall I might have the name of two recommended places to stay with brief contact details and the word “waterfall” starred so I can ask people about it when I arrive. The only thing I photocopy are maps, and not many. So I find my guidebooks in the public library. I borrow them from the public library. I find it useful to photocopy maps and pages that I expect to need so I can keep them in my pocket instead of carrying a huge book around with me all day. Once in Chile I gave the photocopies of the Calama map and hotel listing to a couple that were arriving without a map, and later I shared a taxi with them to the airport. I love keeping old guide books. They’re sort of like journals in that I put notes in the various places I went along with my little corrections to entries.